Integrated agency Turn Key has been appointed by Leeds-based Hitachi Personal Finance. A brand awareness campaign, "No tall tales. Just low rates", has already been implemented across different media channels including outdoor, direct mail and social media. 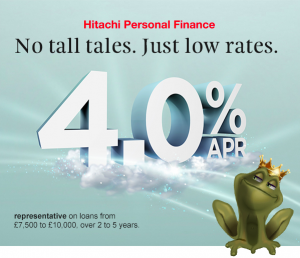 The aim was to promote Hitachi's new 4.0% interest rate. Turn Key MD Phil Dean said: “Hitachi’s brief called for creativity and imagination, which is where Turn Key truly comes in to its own. Turn Key recently announced it had opened an office in Los Angeles.